First, the all-important question: Is The Conjuring 2 scary? Like, jump out of your seat, watch through your outstretched fingers scary? The answer to that is “yes.” Under James Wan’s direction, even the most clichéd haunted-house tropes (and this movie is bursting with them) are genuinely creepy, and although the movie isn’t overly reliant on jump scares, the ones it does use—well, they work. On a lizard-brain level, The Conjuring 2 taps into the universal childhood fear of the dark, and some of its simplest moments—like a little girl hiding under the covers with a flashlight—are its most effective, bolstered by skillfully executed sound design and Don Burgess’ gloomy cinematography. Speaking of tropes, that’s where the “based on a true story” bit comes in. The main plot of the film revolves around a real-life incident known as the Enfield Poltergeist, an extremely well-documented case of a supposed ghost who terrorized the Hodgson family of North London from 1977 to 1979 and was apparently a fan of the classics: knocking on walls, shaking beds, throwing furniture, and even the occasional haunted kid’s toy. And as malevolent spirits often do, it picked on one of the children in particular, 11-year-old Janet Hodgson (Madison Wolfe). Call it a collective delusion, or a desperate cry for attention from a disturbed child. Or call it what the movie very explicitly calls it: The Devil. 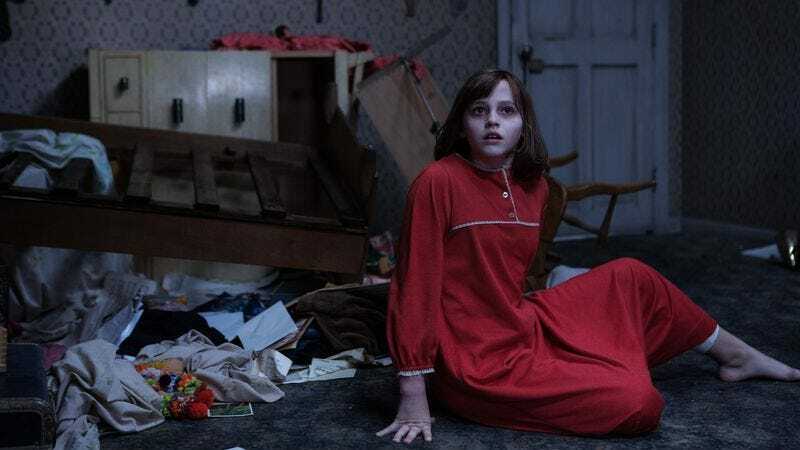 With this installment, the Conjuring movies may have overtaken The Exorcist as the most Christian of horror franchises, taking place in a universe where the Catholic Church is the spiritual S.H.I.E.L.D. and demon hunters Ed (Patrick Wilson) and Lorraine Warren (Vera Farmiga) its holy roller super-agents. The film opens with the Warrens investigating the famous Amityville case, during the course of which Lorraine first encounters the hellish presence that will haunt her for the next few years. Fearing for his life, she begs her husband to suspend any future paranormal investigations, to which he reluctantly agrees. Until, that is, a priest arrives to give them their next mission: Travel to London and confirm the veracity of reports of a demonically tinged haunting. It’s also worth noting that The Conjuring 2 is more than two hours long, allowing for lots of escalation. And while each individual haunting scene can be white-knuckle intense, by the dozenth or so such shock, the film starts to lose momentum. So the final confrontation, when it does come, is a relief in more ways than one. The long running time also allows Wan to overthink his demonology: The main villain, an infernal nun, is appropriately nightmarish, if reminiscent of the veiled “Bride In Black” from Wan’s own Insidious. (See: exhibit A and B.) What’s less compelling is the insertion of the “Crooked Man,” a storybook scarecrow monster that starts spreading Babadook-esque chaos about halfway through and is explained as the demon assuming a form that’s familiar to the Hodgsons. Which would be fine, if it weren’t for the two familiar forms that the spirit has taken already. When The Conjuring 2 focuses its efforts on scaring the audience, it succeeds, wildly. And why wouldn’t it? Wan’s got his horror technique locked down at this point. It’s the parts where it wanders away from the basics of creating and releasing tension that prevent it from outdoing its predecessor.